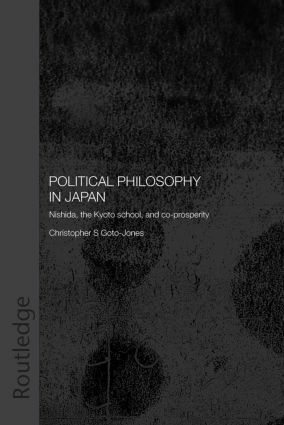 Political Philosophy in Japan focuses on the politics of Japan's pre-eminent philosophical school - the Kyoto School - and particularly that of its founder, Nishida Kitarô (1870-1945). Existing literature on Nishida is dismissive of there being serious political content in his work, and of the political stance of the wider school. Goto-Jones contends that, far from being apolitical, Nishida's philosophy was explicitly and intentionally political, and that a proper political reading of Nishida sheds new light on the controversies surrounding the alleged complicity of the Kyoto School in Japanese ultra-nationalism. This book offers a unique and potentially controversial view of the subject of Nishida and the Kyoto School. Introduction: Political Philosophy in Japan and the Contradictory Location of Nishida Tetsugaku 1. Theorising Dissent - Intellectuals, Language, and Political Sleight-of-Hand 2. The Politics of Harmony and Awakening - Confucianism and Buddhism as Political Thought in Japan 3. The Early Nishida and the Place of Japanese Political Philosophy 4. (Re)Locating the Later Nishida - Ideology and Philosophy in Wartime Japan 5. Nishida's Shadow - The Kyoto School and the Manipulation of Nothingness Conclusion: The Philosophical Site of Politics in Japan - Shisô Sensô, and the Defeat of Nishida Tetsugaku? Christopher Goto-Jones is lecturer in Modern Intellectual History at the University of Nottingham.